More info:Prices based on 2 adults sharing. From $2740 - $2830 per child inc UK flights. Mimimum age 7. 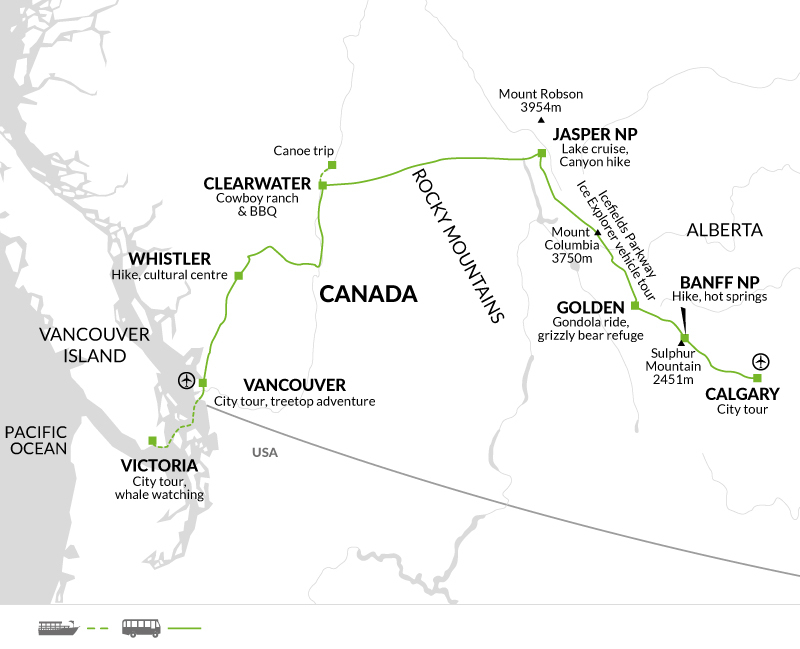 This family adventure tour visits some of the most impressive conservation areas through British Columbia and Alberta, namely Clearwater, Wells Gray, Banff and Jasper National Parks as well as some equally majestic provincial parks. Here we will see at first hand how responsible tourism can be a force for good as it provides a valuable contribution to wildlife and environmental conservation and education. On most nights we camp – a lower impact option than staying in hotels – and make a point of adhering to the strict guidelines laid down by the environmental authorities here. We recommend that travelers bring biodegradable soap to minimise their own impact too. We are also careful to avoid disrupting the wildlife we come into contact with, and for this reason limit our group size to just 12 persons. Our local guides are able to give us a unique insight into the area’s traditions, history and wildlife. Whenever possible, we use locally owned activity providers, such as our whalewatching supplier in Pacific Rim National Park. The tour supports many small local businesses along the way – from the purchase of camp provisions to opting for small-scale accommodation. We shop at local stores for picnic items, and our Tour Leaders will encourage us to eat in family-run restaurants and visit local shops whenever possible. This all brings economic benefit to the local communities that we visit. Our Tour Leader is Canadian, and will guide us through the National Parks that they know so well. We travel in small groups of 12-13 people, allowing us to stay in smaller properties and eat in more local establishments, while larger coachloads of 40-50 would need to eat in more touristy places. This helps minimise the effects that large groups have when visiting remote areas and small villages.